An article in Tuesday’s Trentonian recounts interviews with Trenton Central High School students, almost all Black, Hispanic, and poor, who are stuck in a district where they feel unsafe and uneducated. Simultaneously, an appellate court ruled Monday that the New Jersey Department of Education’s regulations governing PARCC assessments “are in violation of laws passed by the Legislature.” Those particular laws say that high school diploma qualifying tests must be given in 11th grade but the PARCC tests are given in 10th grade for English Language Arts and Algebra 1 tests are taken in 8th-12th grade, depending on when students take the class. These two stories illustrate the clash between the power of those determined to undermine attempts to hold schools to reasonable standards, primarily anti-accountability groups like NJEA, Save Our Schools-NJ, and Education Law Center (which brought the suit), and the impotent reality on the ground. Up at the Statehouse, legislators situated within spitting distance of Trenton Public Schools could change the law that constricts the state’s ability to administer grade-level tests. But the Legislature won’t. It hasn’t touched the law since 1988 and, anyway, who’s going to buck the state’s powerful teacher union and its allies? “I think that’s why a lot of people say teachers don’t care either,” a student said. When asked to estimate the percentage who don’t seem to care about the students in their school, the majority of the teens said approximately 70-75 percent of teachers seem like they don’t want to be there. The whole point of implementing PARCC five years ago was to adopt a test aligned with our new course content standards. Our diploma qualification test, the High School Proficiency Assessment (HSPA), was set as low as middle school-level proficiency. But NJ’s PARCC results (which, by the way, improve each year) belie Repollet’s pollyanna-ish take on NJ student achievement and, therefore, must go. 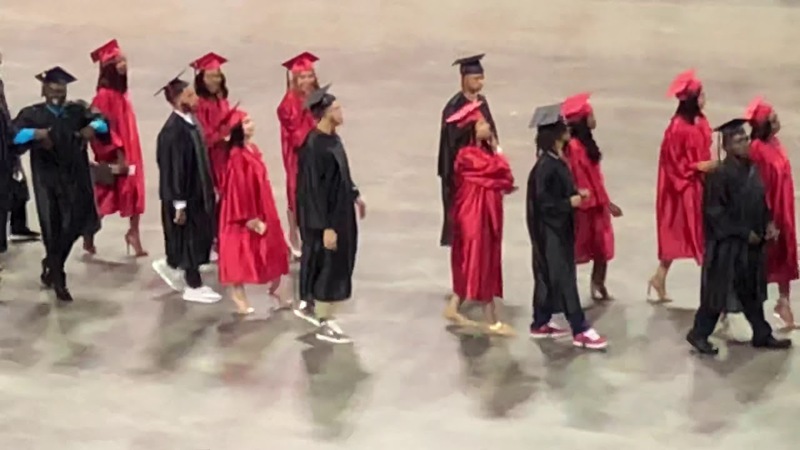 Let’s emulate those brave students and get real: NJ has a long and sordid history of handing out high school diplomas like glow sticks at a rock concert. In fact, those diplomas signify nothing but seat-time. Chris Cerf, former DOE Commissioner and Newark Superintendent, describes the “travesty that so many students graduate from high school, have the diploma in hand and when they go on to the next phase of life, college in particular, they need to take remedial courses.” Elevating course content and aligning it with accurate assessments were attempts to mitigate that travesty. But that may be too hard a slog for DOE and union leaders married to the pretense that all NJ high school graduates are ready for college and careers. How did New Jersey graduate nearly 89% of the Class of 2014 after four years of high school, requiring them to have been successful in Algebra I coursework, and yet so many students [one out of three first-year full-time students at Stockton State and 82 percent of first-year full-time students at Essex County Community College] immediately enrolled in remedial courses in either computation or Algebra I? –HSPA was not a measure of college readiness, leading to a mismatch between students/families believing they were ready when they weren’t. –Curricular gaps, e.g., no clear definition of what Algebra I was. –Lack of instructional techniques and alignment to meaningful critical thinking and problem solving skills. I get that administering tests linked to diploma qualifications to students not in 11th grade conflicts with NJ law (although I don’t know why no one noticed this before, unless legislators and other officials assumed that resorting to this sort of sophistry was beneath the gravitas of the Education Law Center, which represented the plaintiffs). I get that it’s embarrassing to union leaders and their acolytes, who currently include Repollet and Gov. Murphy, to confess that we are, in fact, not “achieving excellent and equitable educational opportunities.” I get that the powers that be might be well-served by having a discussion about whether it’s worth having a diploma qualifying assessments, particularly if it means dumbing them down and lying to parents about their children’s readiness for life after high school. When they get to 11th and 12th grade, we understand where they are academically and districts and schools are actually remediating and providing intervention. We’re not socially promoting. We’re just saying we’re eliminating the PARCC assessment because we have enough data. Really? Tell that to the Trenton High School students right down the street whose performance in Algebra 1 is expunged from the School Performance Report because so few kids reached the benchmark for proficiency. You can look for them in a remedial college course, in low-paying jobs, or on the streets.